A great turn out for the first run this year of the excellent Derby Runner Cross Country series, on Sarah Lawrence’s birthday. The debut of the shiny new club tent was successful and we have a photo to prove it! It was a two lap course, about 5.7 miles long and only a bit undulating. 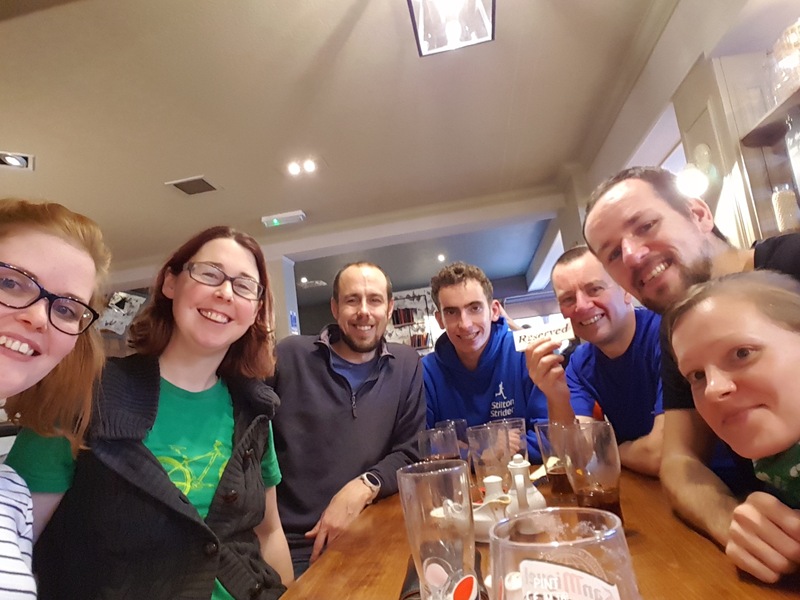 After a leisurely start, we embarked on a lovely autumnal run through the woods, with only a bit of mud and five river crossings, including the Mann trap on the home straight. Luke Eggleston came past running really well and finished in 80th place (41.22), then Greg Pettingill (46.14), Matt White (51.16), Clive Kent (55.41) and Ben Pickard (who diverted to rescue a fellow runner and finished in 57.30). Vicki Lowe was the first Stilton lady home in 63rd place (53:23), followed by Sarah Lawrence (66.51), Charlotte Allen (68.58), and finally Jenny Kent and Laura Pickard (73.50 and 73.51). The support from marshals and volunteers was fantastic with great Halloween-themed costumes and enthusiastic cheering! Followed by a lovely pub lunch at the Copt Oak.